In partnership with Esperanza, PCMS presents The Lost String Quartet with the Momenta Quartet and Fernando Villa Proal. Directions will be sent in an email confirmation. The Lost String Quartet is an original production in Spanish for children and adults of all ages, based on the children’s book by N. M. Bodecker. 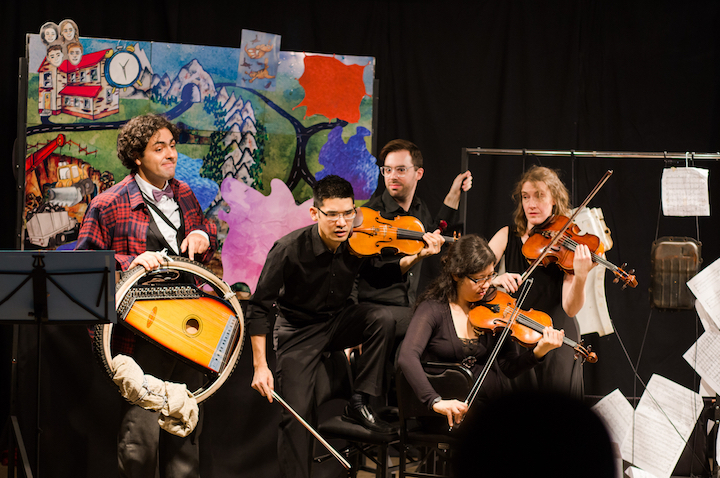 The Momenta Quartet and Fernando Villa Proal combine physical comedy and string quartet performance to tell the story of the misadventures that befall a string quartet on its way to a gig on the other side of the mountain. Throughout the course of the story, the quartet’s car and all of its instruments are destroyed. As each instrument meets its unfortunate demise, an original junkyard creation by experimental percussionist Michael Evans takes its place. As the old adage goes, the show must go on! Against all odds, the Momenta Quartet gives a concert that everyone in the audience will certainly remember. Lead support is provided by the William Penn Foundation and additional support from Cynthia Cooke, MD.